Witold Maliszewski made a vast contribution into the establishment of music art in Ukraine. In 1913, he was among the founders of the Odesa Conservatory (today – the Nezhdanova State Music Academy in Odesa). Its graduates include such celebrities as David Oistrakh, Emil Gilels, Yakov Zak, Mykola Vilinsky, Kostiantyn Dankevych, Serafym Orfeiev, Bella Rudenko, Halyna Oliinychenko, and many others. Invisible threads connected Maliszewski not only with Odesa and St. Petersburg, where he studied, but also with Kyiv. Kyiv is the place where his student Mykola Vilinsky worked and where his niece, Inna Konchakovska (1902–85) lived. She was a daughter of the owner of the famous house on Andriivsky Uzviz, 13, in which Mikhail Bulgakov lived. Incidentally, in hard Soviet times she preserved for Kyiv this unique house, which is now the world-known Bulgakov Museum. 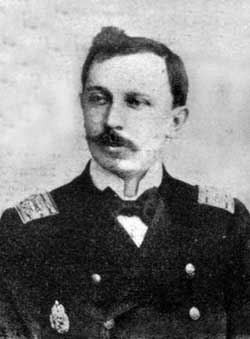 Maliszewski was born on July 20, 1873, in Mohyliv-Podilskyi. His father was sent into exile to the Caucasus for participating in the Polish Rebellion, and the young Witold started his music education in Tiflis in the composition class taught by Ipolitov-Ivanov. Later he was taught by Rymsky-Korsakov in the St. Petersburg Conservatory. While studying there, he was greatly influenced by Glazunov. Maliszewski graduated from the conservatory in 1902. Soon Maliszewski became a prominent member of the so-called Belyayev’s Circle in St. Petersburg, which united both the Russian and the foreign music elite of the time. The first symphony composed by Maliszewski was performed along with the premiere of Anatoliy Liadov’s Baba-Yaga, and it was lauded by the well-known critic Vladimir Stasov. Maliszewski’s many works were published in Leipzig by Mitrofan Belyayev’s publishing house. The composer dedicated his String Quarter for Violin and Cello to his memory. In October 1908, the newspaper Odesskiy listok published Maliszewski’s photo on the occasion of his appointment as head of the Odesa Branch of the Russian Music Society, and in 1913 he became the founder, the first rector, and professor of composition in the newly-organized Odesa Conservatory. There Maliszewski involved well-known specialists of the local music school, which served the basis of the conservatory. His composition classes were attended by Vilinsky, who graduated from the conservatory in 1919 and became a teacher in 1920. The Odesa Conservatory is the place where Teofil Rikhter, a Vienna Conservatory graduate and talented pianist and organist, started to work. He is the father of the famous pianist Sviatoslav Rikhter. The prominent music critic Olekandr Ossovsky also worked for a while in the Odesa Conservatory. Like Maliszewski, he was a member of Belyayev’s Circle and had family roots in Ukraine. He wrote about his desire to give a concert of his works in Odesa and sent Vilinsky a tentative program. “On my side,” Maliszewski shared his thoughts, “It would be a report of my work in Poland before the country which used to be my homeland, the school to which I owe my moral achievements.” In the same letter he sent greetings to Pavlenko and other friends of his. In another letter dated Aug. 3, 1936, Maliszewski told Vilinsky that he had appealed to Glier and Shteinberg, too. These letters were not a mere reflection of the emigre’s feelings; they reflect the wonderful facets of Maliszewski’s personality. He had a successful career and recognition in Poland, teaching in the Chopin Musical School and simultaneously heading the Warsaw Music Society. In 1927, he became the head of the First Chopin International Competition for Pianists. In 1931 through 1934, Maliszewski headed the Music Department at the Polish Ministry of Education. In 1931 through 1939, he was a professor at the Warsaw Conservatory. Vilinsky started to solicit for the implementation of his teacher’s plans. But those were cruel times, and many things were banned (including foreign correspondence), and such projects posed danger even for their participants. Already a complicated case, it was stalled. In his letter dated 1936 Maliszewski agreed with Vilinsky on the possible date of his concert — the 25th anniversary of the founding of the Odesa Conservatory in 1938. Unfortunately, Maliszewski’s dream to perform his works in Odesa was doomed to fail; he did not received a permission to make the tour. Maliszewski died on July 18, 1939 in Zalesie, Warsaw’s suburb. Maliszewski’s ouevre includes the following works: five symphonies, “Froehliche Ouverture” (1910), opera-ballet Syrena, ballet Boruta, Requiem, Mass (1930), Fantasia “Kujawy” for Piano and Orchestra (1928), Concert for Piano with Orchestra (1938), chamber instrumental ensembles, sonatas for violin, cello, and piano, three string quartets, a string quintet, plays for piano, songs, and romances with the lyrics by Alexander Pushkin, Vasily Zhukovsky, and Leopold Staff. The torch lit by Maliszewski is still burning – the Nezhdanova Music Academy in Odesa is one of the leading higher music education institutions in Ukraine, and Maliszewski’s students and the graduates of his conservatory have made a considerable contribution to the music culture of our country.